In this respect, the Bloody Sunday Report followed traditional lines - blame those at the bottom, protect those at the top. It was this which allowed David Cameron to welcome the report while declaring that the reputation of the British army itself remained unsullied - the “rotten apple” theory in action. The evidence had shown that the apple-barrel was rotten to the core. Cameron would have found it difficult to use such forthright language - the killings “unjustified and unjustifiable” - had those named for involvement in the crime included Major General Robert Ford, Commander of Land Forces, Northern Ireland, at the time, and future Chief of the General Staff Michael Jackson, adjutant on the day to the commander of the unit which carried out the killings, the First Battalion of the Parachute Regiment. 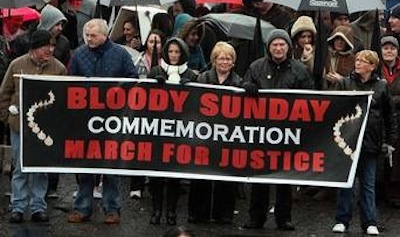 Toleration of murderous behaviour might have been inferred from the fact that no inquiry had been held into the Ballymurphy massacre nor any soldier disciplined nor any statement issued by the political or military authorities expressing sorrow or regret at the 11 deaths. What were the paras to believe but that what they’d done in Ballymurphy was acceptable to their superiors - indeed, was what had been expected of them? Saville’s conclusion that there was no evidence of a “culture of tolerance” would be unremarkable if by “evidence” he meant testimony to the Inquiry. But he had declined at an early stage to examine prior events in the North on the ground - in itself not unreasonable - that to subject the Ballymurphy incident, for example, to the same level of scrutiny as Bloody Sunday would have made the Tribunal’s task impossible. This makes the statement that “We found no evidence...” puzzling: the Tribunal had decided not to seek such evidence. Ford should have had vivid memory of the paras’ involvement in Ballymurphy. He had arrived in the North to take up his post on August 6th 1971 - three days before the introduction of internment without trial which triggered the protests that led to the Ballymurphy events. The internment killings were his baptism of fire which it is impossible to believe he could have forgotten six months later. But Saville finds that he neither knew nor had reason to know that the soldiers of the same battalion whom he sent into the Bogside to deal with the aftermath of an anti-internment march might open fire without justification. This is not credible. The following month saw Major Ted Loden on the witness stand. He had been the commander of Support Company of 1 Para: his men had fired all of the shots which killed or wounded. He described how, late in the afternoon, shortly after the killing ended, he had taken statements from the soldiers who had fired rounds and in each case had plotted map references showing the location of the shooter and of his target and had noted the soldier’s account of why he had fired - the target had appeared to be armed with a gun or a nail or petrol bomb or whatever. Loden told that he had interviewed the soldiers one by one as he sat in the back of an armoured vehicle at the paras’ forming up point on Clarence Avenue a few hundred yards from Rossville Street, with the map spread out on his lap and by the light of a battery-powered lamp. He had written out the details by hand. A number of other documents in Jackson’s hand, also discovered by the MoD man, were produced. These were narrative accounts of the events of the day by Wilford, by the commanders of the three para companies which had gone into the Bogside - Support, A and C - and by the battalion intelligence officer. Taken together with the shot-list, these represented a substantial hand-written dossier which it must have required considerable time and painstaking labour to produce. In his report, Saville resolves one of Jackson’s difficulties by accepting both Loden’s original claim that he had written out the shot-list and Jackson’s subsequent explanation that he must have copied Loden’s script verbatim - although Jackson could offer no explanation why he might have done this or recall the circumstances in which it might have happened. Most common-sense people would see this not just as evidence of a conspiracy to cover up the truth but as a practical account of the conspiracy in action - with General Sir Michael Jackson at the heart of it.